I was in a conversation with some folks associated with the University of Alaska and wrote the following bit about my past work. With a bit of editing for a different context, and the usual expansion to flesh things out a bit (about crossing commons, in particular) I thought it might be worth posting here. I pulled out my copy of the exec summary and appendices for the 2004 consulting report on University of Alaska technology transfer. The report noted among other things the absence of any senior UA official that advocated for technology transfer efforts. The report also listed a range of areas that appeared ripe for development but were mentioned almost off-hand, as if no one actually was prepared to do anything (or knew what might be done). The report includes a copy of an article that the Chronicle of Higher Education (here, paywalled, sorry) wrote about my work at UW and UC Santa Cruz. The approach I developed (by necessity) involved helping investigator-led projects create working relationships with capable audiences, often *before* patentable stuff shows up. This approach runs contrary to the normal “get disclosures, file patents, try to find anyone to take a license” approach that now dominates. That “normal” approach is expensive, slow, and largely ineffective. The commercialization rates at the best university programs are on the order of 0.5%–1 in 200 inventions. And those programs can appear financially successful with only 1 big deal every 20 years–1 big deal in 1,000 or more inventions. That’s not so much tech transfer as it is speculative prospecting across a portfolio. By contrast, the approach we used at both UW and UCSC starts with non-IP intangible assets and copyrights, develops various sorts of distribution programs–workshops, memberships, consortia, code or data distributions, web sites, libraries, publications–and develops working relationships with folks on the technical side of things–early users. A project within a university (or any other organization) creates stuff worth teaching to others–to individuals in companies, in other universities, out in the big wide world. IP methods add strategies to the methods of distribution that help to build the resources available in the project commons and also in the broader commons (in the diagram, the gray region. All this area is “pre-competitive” if you wish, platform formation, the pelaton (to use the bicycle racing term). For this area, exclusion is not the basis for competition–effective use is. Anyone who wants access can join the commons. If folks want a sealed-up version, a product version, they can wait until someone joins the commons with the idea of creating a product version, complete with full instructions, a feature list for the likely user, warranties, service contracts, and whatever other post-sale support is needed. All that is the blue region in the diagram, the “market,” if you wish. Market is not the primary goal of either the research or the distribution–the goal is use, as quickly and readily as possible, but with an eye for building a platform in a commons before there’s any competition that depends on excluding others. In other words, platform in commons first, and then see if a market also develops. In the conventional approach to university technology transfer–the usual Bayh-Dole narrative–“commercialization” is the primary goal. Is there a market? How can a patent right extract value from this market? Who are the market leaders? Can one do business with one of the leaders? Can one interest venture capitalists in disrupting the business of the leaders? Can one set up a company that looks like venture capitalists might someday invest to disrupt the business of the leaders, so that the leaders buy up the company before that can happen? These are the questions that frame “commercialization” of patent rights from universities. The fundamental premise, the starting point, then, is to prevent a commons from forming. 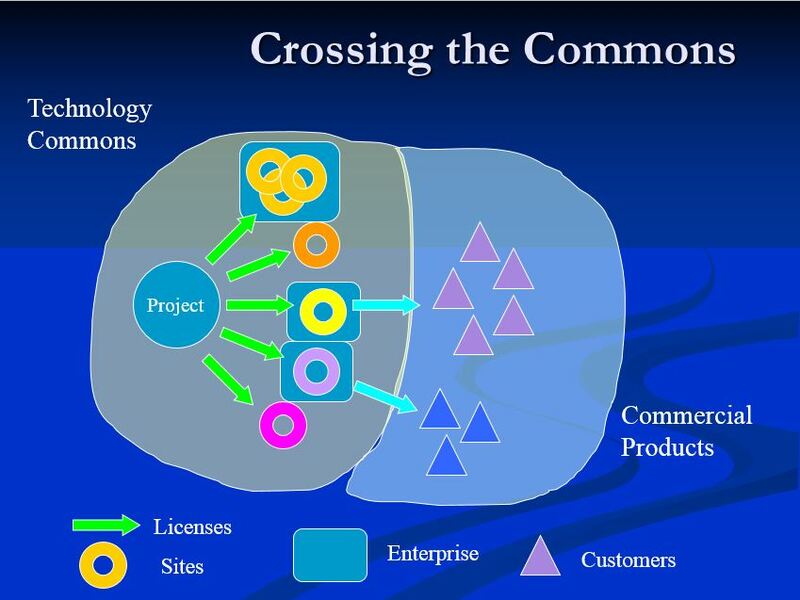 There’s no commons in the project–invention rights are extracted from the project. There’s no make-use commons–patents are managed to prevent use in favor of finding a monopoly investor–big company, venture investors, seed investors hoping for either of the other two to buy them out. This now-conventional approach is antagonistic to immediate use, to commons formation, to platform formation, to anything “pre-competitive.” It in fact destroys these things, prevents them from happening. No wonder that licensing under Bayh-Dole’s standard narrative is so difficult–first, university ownership extracts key assets (patent rights) from projects and tries to license these rights bare for money. Second, the licensee has to be one that makes a commitment to “develop” the “technology” into a “commercial product” sold for a royalty. Third, that commitment has to take the form of an exclusive license–cutting out everyone else. Fourth, there’s no allowance for this exclusive licensee making a commons by cross-licensing or dedication of the patent rights to a standard–it is sales, infringement, or bust. And most often, it’s bust. This conventional model put forward by university patent administrators has to be the most difficult, damaging, and corrupting approach to encouraging practical application that’s possible. That it would become the default, so fervently presented across the country and advocated by a string of university front organizations such as AUTM shakes one’s belief in common sense. But then most anything can be made to sound reasonable by folks who have nested in what they take to be an entitlement. It turns out that developing distribution projects that create platforms do a great job in encouraging use–practical application. Use encourages platforms, and platforms lay the ground work infrastructure for commercial development. Product comes after use, not before use, not in place of use. Sure, every so often product might come first. But even for therapeutic drugs, the argument that each new drug must cost a billion dollars to develop just doesn’t hold up. But university patent administrators work overtime to make sure the claim holds up–by their choice of licensing strategy, they choose to drive costs up to create what gets called a “high-risk, high-reward” speculative environment. Buried in that “high-risk” part is “made by our policies and actions highly unlikely” and buried in that “high-reward” part is “monopoly pricing to exploit human suffering for maximum gain.” It’s clever how abstractions can cover over the value proposition and make it seem, well, in the public interest rather than running counter to it. A project distribution program–by encouraging use and platform development and drawing in others who find value in having access–also creates visibility, and visibility acts as social proof that a research program is doing good things. The social proof attracts people who want access, or who want to develop things in a particular direction. Access interest comes in phases–first visionaries and techies, then folks who want to see what the visionaries are using, and then folks who want to use what everyone seems to be using. It takes time–3 to 5 years to demonstrate there’s a user/support/developer community. But in that time one can build projects that have $50K/yr+ licensing income (25 companies at $2K/yr, say). Our best UW/UCSC projects were generating $800K/yr (such as 200 company sites at $4K/yr). These are not the payouts in hundreds of millions that get splashed in the press by university PR folks. But this income reflects value in a make-use commons–and directly reflects practical application. No speculative exclusivity needed. Speculative exclusivity can come later, after there’s a platform, to deal with non-essential extensions. There, let folks compete or standardize all they want. These sorts of projects are low cost to start, create lots of room for entrepreneurs to participate, and help local entrepreneurs also meet industry contacts. These projects can do as much to import research technology to work with as to export it. And these projects target a wide audience of scientists and engineers at the company work group level. Patent licensing tends to deal with folk at the VP/legal counsel level–a top-down acquisition that’s slow, expensive, and unlikely. But if a technical person wants access to a research tool, and they can get it easily through a normal-looking sales channel (sell a license rather than license a right), then anyone can get what they want in hours or a couple of days–and the broader acquisition discussion moves *up* in the company with use. Focusing on the work group in companies also means that one’s efforts are already scaled for entrepreneurs and small companies–a work group in a big company is on the same scale as a small company. So the non-exclusive site license becomes a sweet spot. Of course, we mostly did away with the word “license” at this scale. We’d use anything else–access, delivery, assistance, subscription, membership…. “License” triggers all sorts of lawyer forebodingness, delays, and bother. The approach I prefer emphasizes social network methods (not so much social media as the role of “strength of weak ties” and “congestion” in a network. But sure, SEO helps, too). Much can be done with web-based interfaces. The Flintbox and iBridge backends were developed in part based on our UW work (I served as well as a volunteer advisor to Flintbox for a time)–but these tools got diverted, becoming “tech available” listing platforms rather than project transaction tools. If a university can help to create a flurry of use-interest around research assets (not just press releases), then that helps local entrepreneurs see what is possible, gets them easy access to the same assets, and provides them with access as well to the university’s user communities to mine for initial customers and possibly strategic partners. Necessarily, this is a faculty/talent-first approach. The tech transfer folks join a faculty-led project rather than extract IP from a lab and try to bare-license it for profit. Our fastest deal–from invention to commercial sale–was one week. The new development was a method of creating materials for a self-build 3d printer. The university lab ran with open strategies, called Metrix Create:Space, a local maker space company they’d partnered with before, and Metrix was selling product a week later. No license agreement, no need for the university to get royalties. Transfer was way more important. Visibility was a helpful side-effect. As was the continuing relationship with Metrix. The university lab to created Open 3dp, a web blog of its weekly activities–way better than a static university web page. These sorts of things got the lab lots of network centrality, attracted in a host of wildly interesting people we would never have otherwise met, and eventually the lab landed a multi-million dollar, multi-year research agreement with a major company wanting to exploit 3d printing technology. In the meantime, there were multiple student start-ups, and the first 3d printed boat, and a major international business plan competition win. The lab went from being ignored by university administrators (because it didn’t get a pile of federal grants and focused on teaching students design by making/using 3d printers) to front-page College of Engineering stuff. Pretty much everything in that story comes from Mark Ganter and Duane Storti’s Solheim lab–the relationship with the Burke Museum, the powder printing (using custom, ultra low-cost powders), the student 3d print club WOOF–all these are non-IP intangible assets that matter. Patents can play a role, but there’s no need to insist on them or hold everything back with the twisted idea that patents have to carry all the value. Conventional university tech transfer offices see this approach as a threat, as it challenges their claim that invention-patent-license-commercialize-money is the only or best or first way to do things. It also does not use a single system. So there is no “template” patent license–there are five or ten of them, for use in different situations. There is no standard industry research agreement because one can use frame agreements that work using task orders, and so can adapt to all sorts of different transactions without having to start over on the negotiations–sponsored research, donation, fellowship, SBIR, STTR, GOALI, license, visitor agreement, data exchange, confidential material, material transfer–all can be tasks within a broader agreement. At this point, we hit the “Strictly Ballroom” problem for the conventional university IP folks. Since they don’t know how to do this sort of thing, they oppose it. Anyway, that’s a different approach than the dominant patent-and-hold for an exclusive license payday. It’s way more coordinated with local community than any patent-only approach. There’s room for both approaches (and more) but it takes work to keep university administrators from demanding one policy ring to rule everything. This entry was posted in Commons, Open Source, Technology Transfer. Bookmark the permalink.